OTARC continued its public dissemination of information about the upcoming changes to the DSM-5, hosting a webinar Wednesday 13th February. Thank you to everyone who attended. This was the first time we have hosted a webinar and, despite some minor technical glitches, we were pleased to receive mostly positive responses from attendees. We expect to host other OTARC webinars in future, so please check the Events page on our website. As a result of the webinar, Dr Giacomo Vivanti was invited by the Australian Government Department of Families, Housing, Community Services and Indigenous Affairs (FACHSIA) to deliver the DSM-5 presentation to the Autism Advisor Forum. The experience of hosting a webinar and the ensuing feedback proves this technology is important in helping us to share OTARC’s understanding of issues related to ASD with the community to further build capacity. With 626 people registering beforehand, we knew there was great community interest. It was pleasing to read that about 30% of attendees logged in as a group, and continued to have discussions in their office once the webinar had finished. 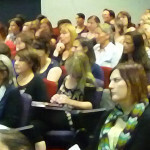 Attendees were scattered throughout Australia in every state and territory, including Victoria, where about 50% of the attendees logged in from a regional city or town. This indicates that we were able to reach people who would otherwise find it hard to attend an event at our Melbourne campus. We started a too early in the day for people in Western Australia, so we will hold future webinars later in the day. Whilst the platform we used for the webinar was stable and functional for many, we are reviewing other platforms and delivery methods. We look forward to letting you know the details of the next OTARC webinar.